AG Adriano Goldschmied The Stevie Slim Jeans. Waist Flat Across 15”. Rise 7.75”. Inseam 31.5”. Thank You For Viewing. Take A Look At The Other Items. 8oz. Luscious Stretch Sateen, 80% Cotton, 15% Modal, 5% Polyester SKU# LSN1288 Item Details Super skinny. Our signature skinny is a chic, versatile closet staple. Size 27 Super adorable !!!! Pants/jeans are in great shape. Inseam: 28". AG Adriano Goldshmied Stevie - Skinny Straight Ankle Jeans - Sz 29. Condition is Pre-owned. Shipped with USPS Priority Mail. Condition: gently pre-owned - no rips, holes, or stains. Measurements (approximate, laying flat): Size: 29R Waist: 16" Hips: 19" Length: 37" Inseam: 29" Rise: 8" Leg opening: 5"
Condition : It has a small pick shown in pictures and marked as irregular. Front Rise: 8”. Back Rise: 13 1/2”. Inseam: 33 3/4”. Outseam: 41 1/2”. AG Adriana Goldschmied brown 28R Angel Boot Cut Corduroy Jeans. In good condition. Good used condition, no flaws. Measurements available upon request. Comes from smoke free, pet friendly home. Fabric content: Fabric content label has been removed. It is a cotton/stretch fine wale corduroy. Fly: Zipper. These jeans are pre-owned but were gently worn and are still in excellent condition. Back rise: 12". Leg Width at Hem: 5.5". Rise: 7.5". Care Instructions: machine wash. Material: 55% cotton, 42% tencel, 3% polyurethane. zip and button close. Inseam: 29". Please click READ MORE for a full item condition with possible flaws. See the second picture for actual measurements of the waist, length, hips, rise, and cuffs. Material Cotton,Elastane. Type Jeans. Discover daily new arrivals in all seasons, sizes and styles that you can't find anywhere else. Color Brown. Item Details. Style: Corduroy Jean. Designer: AG Jeans. Inseam: 32. Material: Cotton Blend. Color: Brown. Zip fly with button. Front rise - 6". Brown in color. 98% cotton 2% lycra. Inseam - 26". AG 29R (29”W X Ankle) "THE STEVIE ANKLE" Slim Straight Leg Super Stretchy EUC! Label Size: 29R. PO# AG.21475. The waist would be comfortable at 30" or 29" Stretchy & Comfy either way. Around Knee Area 14” below crouch (Flat Across): 6 1/2”. Machine Wash & Tumble Dry. "Soon to be your Next Favorite Pair of Jeans! 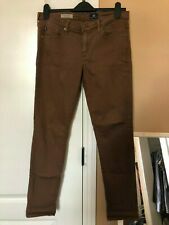 Women's Adriano Goldschmied Jeans The Stilt Cigarette Size 24R Brown Button and a zipper 2 front pockets and 2 back pockets Inseam - 26.5 inches Let me know if you have any other questions and be sure to check out my other items! I do offer combined shipping :) IF there are items you are interested in, please request a combined shipping invoice from me before you pay so I can get you the cheapest price! Excellent condition, no signs of wear, but there appears to be bleaching on the zipper fly, but it doesn’t show when worn, see photos. These are the Angel Cut brown corduroys in size 26 R by AG Adriano Goldschmied. Measurements taken laying flat Waist 15” Hips 17.5” Rise 7.5” Inseam 31” Leg opening 8.5” L211 ag adriano goldschmied Angel Cut Corduroys Size 26 R. Condition is Pre-owned. Shipped with USPS Priority Mail. Waist : 15 1/2" (Side to side). AG The Stilt cigarette jean size 29R. Brown corduroy. Gently used. Slightly stretched out. Wear on the bottom area. inseam 30". They are pre-owned, and show minor general wear / possible fading from wash. There is a subtle, hardly noticeable reddish stain near the button (seen in last photo). Stretchy and soft corduroy denim. Leg Opening: 5". Inseam: 27". Waist: 13". Material: 74% cotton 24% pa 2% elastane. Inseam: 30”. Adriano Goldschmied Jeans Sz 34 Brown Corduroy Cotton Protege Straight YGI F7041 Protege straight leg, made in USA, no flaws Photos tell the story best ... See detailed measurements of the item in photos using a tape measure — check them carefully as sizes vary! Check out our amazing inventory of other items by including the three letters YGI in your search. For example, type in your search ““ickey Freeman YGI ““to see all of our Hickey Freeman items. STOP! Before leaving anything other than positive feedback, please contact us to work out an amicable solution. At YGI, we honor our return policy 100 percent. So, if you are unsatisfied for any reason, simply return the item for a full refund. Our feedback speaks for itself and we want to earn your repeat business. Adriano Goldschmied Tan Straight Leg Women's Jeans Size 30. 29x30x9"
Style: Stilt Cigarette Leg - Legging Style, form fitting. Color: Brown. Inseam: 30". New With Tags Adriano Goldschmied Dark Brown Corduroy Slim Jean Pant. Sz 27 Measurements waist side to side 14 inches. Inseam 32.5 inches. Excellent pre-loved condition, Bootcut flare style jeans with classic 5 pockets design, zip fly and single button closure. Stylish light tan/khaki color perfect for any occasion. Style#BW4381. Style name: The Angel *Waist: 30 in *Length: in *Inseam: 32 in *Front Rise: 6 in *Leg: 9 1/2 in Machine washable. 98% Cotton 2% Elastane (stretch) No damages or Stains. From a PET FREE & SMOKE FREE home. I aim to please and look forward to answering any questions you have. All reasonable offers considered. AG Adriano Goldschmied The Stevie Slim Straight Leg Stretch Corduroy Pants. Chocolate Brown. Woman’s Size 28P Petite. Inseam Measures 28. Pre-owned In Excellent Condition. Please See Detailed Pictures. Great Price & Fast Shipping. There are minimal signs of wear, these are great pants to add to your collection. Great pair of AG Angel bootcut Cords. Material: 98% cotton, 2% PU. Condition: gently used pre owned. AG ADRIANO GOLDSCHMIED JEANS CORDUROY. "THE ANGEL" MIDRISE BOOT SZ 25 X 32.5". Dark brown corduroy, lighter weight, boot cut jean with slight whiskering Zip fly with button closure Classic five-pocket style 98% cotton, 2% elastane Machine wash Made in the USA. Front Rise is 9.5". 60% Cotton, 30% Modal, 8% Polyester and 2% Polyurethane. Adriano Goldschmied AG Jeans Legging Ankle skinny jeans in brown. Casual, distressed style. This item is in gently pre-loved condition. The jeans are distressed with intentional signs of wear (holes, fraying). These Made in the USA beautiful jeans are in excellent condition. Inseam - 26". Adriano Goldschmied "The Legging" super skinny coated jeans. Worn twice. L261424 in.25 in.26 in.27 in.28 in.29 in.30 in.31 in.32 in.33 in.